Michael Lundy is president, Optimation, Independence, MO:816/228-2100; www.optimation.com. Traditional nesting technology has been stuck using the same wasteful and time-consuming process for the last 40 years. Here is a typical view of the process. It turns out that hundreds of manufacturers and thousands of machine tools now employ this new strategy. Many advanced manufacturers, large and small, currently enjoy the benefits of this new technology. The reason that nesting technology is stuck and cannot move forward is simple: It depends on a human to push the buttons to tell the old, obsolete software what to do next. Human interaction takes time. It can take from hours to days to move multiple parts from CAD design to the CNC machine. However, the process can be reduced to 10 to 15 min., thanks to a new approach to nesting. Let’s compare old, obsolete methods to new technology, step by step. The differences between the methods are substantial. The old method lacks any connection between the CAD design and the manufacturing results without requiring people to perform the related tasks. Note that there are two databases—one for design and one for the nesting system. If a design changes, all of the work to create an NC part program must be redone. Worse yet, any design changes require a complex process to match up the two databases. This process can be slow and lead to production of unusable parts. Using the new method, a CAM interface runs internal to the CAD system. This allows design and manufacturing engineering to occur concurrently in a single database. Simply put, concurrent engineering creates a single location for storage of design and manufacturing data. Once a product is designed, it can be sent to the CNC machine within minutes. By having an expert system that will ensure all data is present to manufacture the design, and also ensure that the design can be manufactured with existing equipment and tooling, countless errors and design iterations can be avoided. This proves particularly important as companies move to true 3D models for product design. Hours of work can be done in minutes. And, with less demanding programming requirements, the resources of valuable, talented people are better utilized. Nesting is the next step that the expert system performs. To create a nest, first the parts to be nested must be identified and entered into the nesting system. 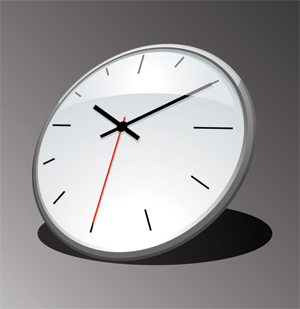 This may sound simple, but most manufactures have a very complex schedule, with parts due now and others due later. Hot parts show up unplanned, and schedules change—for a myriad of reasons. With the old method of nesting, an operator carefully selects a set of parts to produce and begins to push the buttons to create a series of nests. But as production environments change, it becomes impossible to develop a plan that will survive for very long. This can create chaos as fabricators strive for rapid response to maintain schedules in light of the changing environment. • Schedule changes will be responded to in the very next machine cycle. • Hot parts will show up in the very next nest. • Multiple machines will be automatically balanced so that they are collectively als working on the most important parts. • Machines with tooling would have the optimal setup, with minimal overall setup time. • Material efficiency would rise dramatically. • Throughput will increase while production transit time decreases dramatically. By having all of your production capacity focused on the most important parts, they move rapidly through your facility. New technology based on expert systems can build nests just in time (JIT). In fact, this new technology outperforms a manual programmer because it can simultaneously consider material efficiency, schedule adherence, tool management and hot parts. Then the software can limit the number of open orders, manage the flow of orders from multiple raw materials, manage production flow and balance the production load over multiple machines. Optimizing all of these requirements and keeping up with production often is beyond the ability of a human programmer/operator. JIT nesting strategies work with a single machine or multiple machines. The machine operators run the system just like they interface with a typical DNC system that downloads the next program to run. The machine operator does not do the nesting; nesting occurs automatically. When the machine operator requests the next nest, the expert system checks the schedule, and then creates an optimal nest for the target machine. The completed nest then routes to the DNC system and is passed to the machine. Alternatively, for machines on the network, the program can be placed directly on the machine control. Why does material efficiency rise? Since manual nesting is time consuming, multiple nests must be prepared in advance of being run on the machine. These nests typically are created from a fixed set of parts known to be needed at the time the nests are created. While the initial nests will make efficient use of materials, as nesting continues the number of parts left to nest becomes fewer, and so the nests become less efficient. This is called tail-off (Fig. 1 below). JIT nesting avoids tail-off because the process never runs out of parts. New orders als are occurring as prior orders are being completed. JIT nesting blends the end of one set of requirements with the beginning of the next set of requirements, generating huge material savings (Fig. 2 above). Fig. 1—Because manual nesting is time consuming, multiple nests must be prepared in advance of being run on the machine. 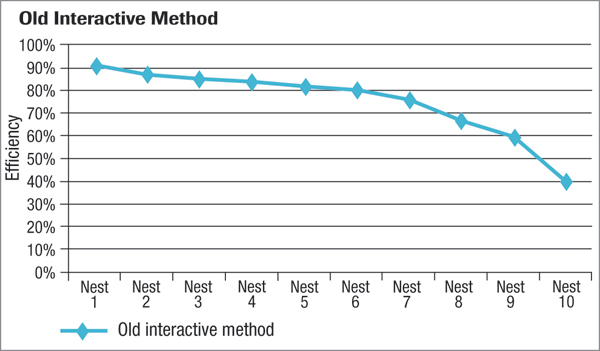 While the initial nests may be efficient, as nesting continues the number of parts left to nest are fewer, and the nests become less efficient. This is called tail-off. • The fabricator will be able to respond to schedule changes in the very next machine cycle. • Multiple machines will automatically be balanced so that they are collectively als working on the most important parts. • Machines using tooling will have the optimal setup, with minimal overall setup time. • Material efficiency rises dramatically. • Production flow is optimized to meet demand from any schedule method, including ERP/MRP, job-sequence scheduling and demand pull. • Throughput increases and production transit time decreases; since production capacity is focused on the most important parts, so that they move rapidly through the facility. Fig. 2—With JIT nesting, tail-off never occurs. New orders are als occurring as prior orders are being completed. • Demand-pull systems are used to dynamically schedule parts through the shop based on actual events. Fewer and fewer manufactures build products for inventory. A shop that builds custom or standard products to order must flow each order to meet a ship date. In other cases the fabrication schedule must support various scheduled assembly lines in a planned order of product assembly. In each case, a single order explodes into multiple parts that then are fabricated from multiple dissimilar raw materials. All of the parts from each order must be completed in order to ship the end product. The challenge: Scheduling these parts through the fabrication facility so that they flow together, a challenge that becomes even more complex when multiple machines are used. The solution lies in JIT kit nesting. Imagine a group of orders sequenced so that order #1 is to be produced first, then order #2, and so on through the last order in the sequence. To move parts through fabrication as quickly as possible, the manufacturer would like to use all available equipment capacity first for order #1, then for order #2, etc. 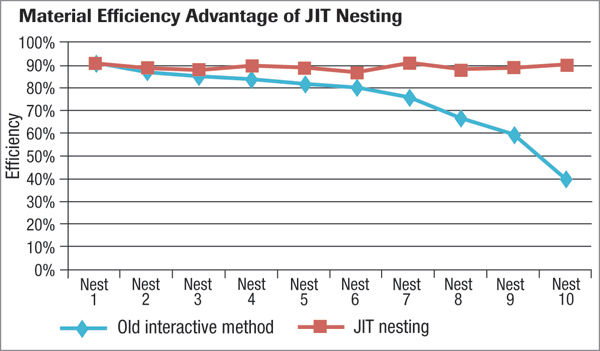 JIT nesting with order management will accomplish this task and provide an optimal set of nests that ensures the order cohesion is met, producing the orders in the desired sequence at the lowest possible cost. • Manages flow of parts so that each order is produced together, managing machine load over multiple raw materials to complete the set of parts contained in the order. • Merges the end of order #1 with the beginning of order #2 to keep material efficiency continuously high. • Dynamically balances the work load on multiple machines by dynamically assigning work to each machine as it becomes available. • Responds to changes in schedule and hot parts every machine cycle. Fabricators that use JIT kit nesting can dynamically manage their production to satisfy their customer ship dates, without using complex scheduling systems not tied to the shop floor. 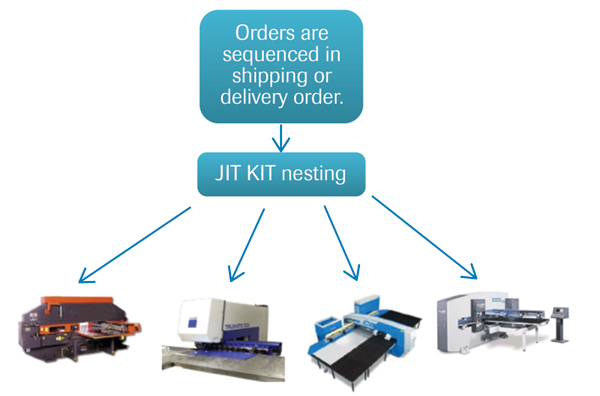 With JIT kit nesting, a fabricator can immediately respond to machine breakdowns, schedule changes, hot parts and other events that impact production. ERP/MRP systems plan orders based on the time it takes to produce a part. Imagine a product made of five parts where part 1 takes one day to produce, parts 2 and 3 take two days to produce and parts 4 and 5 take three days to produce. The ERP/MRP system will launch production of parts 4 and 5 three days before they are required, parts 2 and 3 two days before they are required and finally part 1 one day before it is required. The goal is to produce all parts on time with the least amount of work-in-process inventory. When a shop produces multiple products using the same equipment, it must produce a large group of parts today and each subsequent day. From this large list of parts made of multiple materials, the shop must create a production plan that will meet the schedule and minimize costs for materials, direct labor cost and setup. The production plan also must respond to any hot parts, schedule changes and machine breakdowns. Further, the plan must be able to transition from today’s requirements to tomorrow’s requirements without sacrificing material efficiency and productivity. Consider a hypothetical order comprising five parts of three different materials. To simplify, all parts must be completed today. If the parts are to be welded together into an assembly, it would be beneficial to produce all five parts in the same timeframe—achievable with JIT kit nesting that keeps orders together.